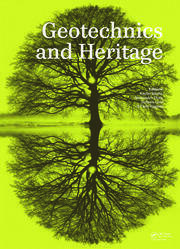 This book is the first of a series of volumes on Built Heritage and Geotechnics, intended to reach a wide audience: professionals and academics in the fields of civil engineering, architecture, restoration and cultural heritage management, and even the wider public. 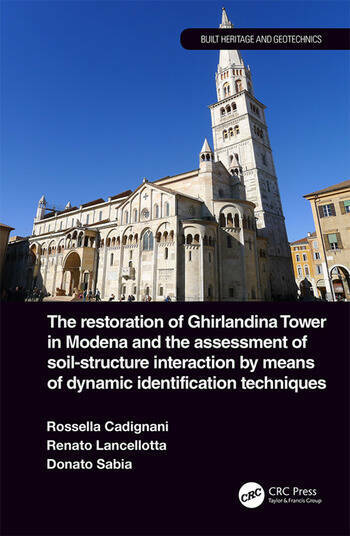 The present volume provides essential information on the history of the construction of the Ghirlandina Tower in Modena, the techniques involved and the restoration works, and proves how the interaction with the supporting soil may explain the reasons behind the corrections that masons implemented during construction, the pattern of settlements suffered by the tower and the Cathedral and their mutual interaction. 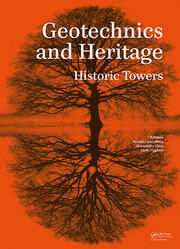 In addition to the above, there is one particular aspect that should capture the interest of a wide readership: in 1997 the Cathedral and the Ghirlandina Tower were included in the UNESCO World Heritage List, and it was recognized that the creation process shared by Lanfranco and Wiligelmo is a masterpiece of human creativity, in which a new dialectical relationship between architecture and sculpture was created in Romanesque art. The Modena complex bears exceptional witness to the cultural traditions of the 12th century in northern Italy's urban society, its organization, religious character, beliefs, and values all being reflected in the history of the buildings. 1. Introduction. 2. Historical notes on the construction of the Cathedral and the Ghirlandina Tower. 3. Previous restoration works in the 1970s. 4. Planning the new investigation studies and the restoration works. 5. The soil as "material with memory": a key to explain the settlements of the tower and the cathedral and their interaction. 6. A primer on soil‐structure interaction and soil condition effects. 7. An advanced approach to assess the behaviour of structures under dynamic loads: dynamic identification analyses. Appendix: Introductory notes on problems related to the stability of historic towers. Rossella Cadignani, born in Modena in 1957, was educated at the University of Florence (Italy), where she graduated in Architecture in 1982 and licensed to practice in the same year. From 1985 to 2015 she worked in the Municipality of Modena. For many years she has been the Director of the Urban Development Planning area, where her work included landscape planning and the preparation of the city strategic plan. From 2004 to 2015 she directed the Historical and Monumental Building Division of the Municipality of Modena. From 2007 to 2015 she directed the restoration work of Ghirlandina Tower and coordinated the Scientific Committee that oversaw the work. In the same period, she was a member of the Technical Committee of Modena’s UNESCO site. Since 2016 she is working as a freelance professional and is involved in historical research on the architecture of her city. Renato Lancellotta, born in 1949, was educated at the Technical University of Torino (Italy), where he graduated in Civil Engineering in 1974. He has been Visiting Professor at University of Texas (Austin) in 1986. Since 1990 he is Professor of Geotechnical Engineering. He has been member of the Editorial Advisory Panel of Géotechnique (2002-2004), Géotechnical Engineering and, at present, is Editor in Chief of the Rivista Italiana di Geotecnica. He has been awarded the Bishop Research Medal (Institution of Civil Engineers, London) in 2003. In 2007 he has been elected Member of the Academy of Science of Torino. At present he is Chairman of the International Committee on Preservation of Historic Sites and Monuments (TC301) and in 2012 he delivered the XI Croce Lecture. Professional experience refers to geotechnical studies for the preservation of historical monuments, including the Leaning Tower of Pisa and the Sindone Chapel in Torino. He has been appointed as a member of the Scientific Committee for the preservation of the Ghirlandina Tower, the Cathedral of Modena, the S.Stefano church in Bologna, the Campanile of Giotto in Florence. Donato Sabia is associate Professor of Structural Engineering at the Politecnico di Torino since 2000. His research interests are related to structural diagnosis, experimental modal analysis and dynamics identification of linear and non-linear systems, model updating, seismic vulnerability of the structures, structural safety of masonry structures. He currently cooperates with the Nagoya City University in joint research projects in Italy and Japan for the preservation of monuments and of structures of historical interest. He coordinates several research project with public agencies on "Structural Control and Monitoring". Since 2002 he is head of the Materials and Structures Lab of the Department of Structural, Building and Geotechnical Engineering at the Politecnico di Torino. He has been involved into dynamic identification studies of the Ghirlandina Tower and the Cathedral of Modena and at present has been appointed as a member of the Commission of the Opera Primaziale di Pisa to monitor the Behaviour of Pisa leaning tower after the stabilizing interventions.